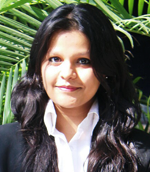 From being a fresher to walking out with an HUL job offer –Ashima's transformation PGDM Journey. 12 January 2017: For Ashima, the PGDM journey has been thoroughly enriching. She considers the analogy of clay to be most apt: “I came into FORE as clay right after my B.Tech. In Electronics and Communication from GGSIP University, waiting to be moulded to perfection into the shape of a thoroughbred professional.” This professional has been hired by blue chip FMCG giant Hindustan Unilever Limited (HUL) as Asst. Sales Manager in the Sales Leadership Training Program. Her journey was made possible by the opportunities provided by FORE to all students - the opportunity to learn how ideating in teams works, conflict resolution and working as a leader. These are all indirect learning tools that provide confidence, flexibility, listening skills, analysis, and situational thinking. This even helps students with little to no work experience to come out industry-ready. Ashima will step out prepared for the myriad challenges that her demanding role will bring. Her key responsibilities under this profile will be to understand the market for present products and their market potential. It will be an on-the-field job that requires dealing with distributors, wholesalers, retailers and understanding their needs and gaps and how the company can effectively design its strategies based on the knowledge gathered. It also requires dealing with the team of salespersons reporting to us and analysing the data from the market. Barring the specific product and market knowledge that she will need to develop within HUL, many of these tasks will be hugely aided by the journey that Ashima has gone through in her 2 years at FORE. The selection process for a company like HUL is extremely demanding. Ashima credits FORE for the manner in which the school prepared her for the selection process, which involved a Group Discussion and 2 panel interview rounds that were very rigorous. Both confidence and technical knowledge were needed to get through all these rounds successfully. The experience that students gain as members of various event organizing committees also always makes for interesting conversation during interviews. On her preparedness levels, Ashima adds, “In my opinion one cannot always be prepared in terms of topics as such, but it is the mentalreadiness that counts, and that is where my time at FORE really helped.” In Ashima’s case, it also helped that her summer internship was in a field directly related to her role. She had worked on a SDM project, which required studying the Beauty & Personal care industry in India and an in-depth understanding of the sales and distribution model of HUL v/s Emami. Besides the development of professional skills, the other huge value addition that Ashima credits FORE with is her personality enhancement through her course work and the exposure that her trip to Singapore and Mukteshwar provided. Her stint at Nanyang Business School, Singapore also offered good international exposure and the opportunity to learn from some of the finest professors in their field. It is this all-round development at FORE that transition a rank fresher into a professional capable of handling onerous responsibilities in a highly competitive corporate environment. And Ashima is clear proof of this.